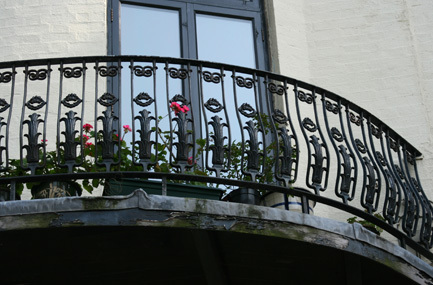 There’s no better way to enjoy the outdoors than on a balcony with customized iron railings! San Marino Iron is the leading provider of custom, handmade iron railings, structural steel, and metal fencing that not only looks beautiful, but is long-lasting and adds value to your property. For over 30 years, our family owned business has been improving homes and businesses in Warren, Detroit, Birmingham, West Bloomfield, Troy, Rochester Hills, and throughout Southeast Michigan. A lot of homeowners, business owners, and builders come to us with a vision for a beautiful deck or balcony that features custom, ornamental designs, but they don’t know exactly what they want or where to start. At San Marino Iron, we provide free design consultations where we can discuss your goals and craft a custom design for your approval. This allows us to work hand-in-hand to ensure that you are getting the perfect results for your project. Nothing says luxury like beautiful ornamental metal designs! Balconies are a great selling point for any apartment or multi-family residence, and enhancing them with custom iron railings will not only attract attention to your building’s exterior, but gives residents even more reason to love their home. At San Marino Iron, we invite you to look over the photos of our previously completed projects to see our high-quality work. If you own a home or business in Warren, West Bloomfield, Troy, Rochester Hills, Detroit, Birmingham, or anywhere else in Southeast Michigan and have questions about the custom metal fabrication services we offer, contact us today. We are ready to design and create the perfect custom metal project for you.